Moravaci fandi 8MS. Bez dal profesore!!! Ivanoff says he's going to take maximum risk out there with his racing lines and his strategy... let's see if it pays off. Ivanoff beat Chambliss in 2016 and went on to win the race so let's see what 2019 has in store. Looking good so far as Ivanoff gets cleanly through the first chicane and the first VTM... it's all good, looking smooth but looking at the split times he's behind the pace and needs to pick it up... more power! It looked promising but Ivanoff has struggled in Lap 2 to maintain momentum. Chambliss has lots of power and aggression and so needs to fly cleanly. Chambliss correcting again for Gate 10 and he has lost the optimum racing line out there. Surely there's no chance that he can chase Ivanoff down... and Ivanoff takes the heat! Velarde thinks he can adapt to the new wind direction... there's been plenty of warning and he's capable of some seriously stylish and sophisticated flying. Velarde into the track... through the first chicane again, looking superb and smooth, a perfect set up for the VTM and a correction there as he goes hard and fast into Gate 7... incorrect level flying and Velarde hasn't avoided that tricky Gate and he picks up +2s in this knock-out heat! He's got some serious baggage now and Muroya has a golden opportunity. Does Ivanoff have a oxygen mask on his right shoulder in case of ending up in the water? Muroya cleared into the racetrack and he's into the Start Gate at 198kts, the splits are as we would expect, in the green. Through the chicane and into the VTM, hard on the G and Muroya is adapting to the new wind conditions and makes it through Gate 7. Through the chicane for the second pass. Muroya a good 1.3s ahead as he heads around into the Finish Gate and no review... no penalties and Muroya has done the job he needed to do... into the Final 4 and the fastest time of the day for the Japanese pilot. 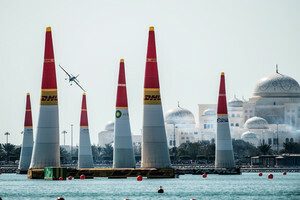 Brageot into the track and he's having some technical issues... but all seems ok right now, as he heads into the track with 199kts... the buzzer goes twice in quick succession as Brageot picks up +3s in total of penalties. Some Over-G and Brageot was temporarily thrown off his game. Not much smoke but Brageot's head is back in the race and he's showing some great flying despite the issues... but it's just not enough in the face of those penalties. Goulian has a real chance here. "You have to go all-out" says Goulian, but he's got a chance to just relax a little in this heat... into the track at 198kts, smooth and on rails through the chicane, and up into the VTM and he goes super-high and the Gs are very low and under the limits. Sensible flying and a little conservative but it's a good strategy as he seems to be keeping something in the tank for the Final 4. Quick and clean, Goulian is in the race for the podium. Hall is up first in this super-competitive heat. He says he missed his lines in the R14 and is looking to own Sonka in the R8 and claim that spot in the Final 4. Hall into the track at 199kts... He's nailing this run... Hall is really picking up the pace and keeping control, through the first VTM and no issues at Gate 6-7. Some serious pace now, Hall stalls a little at the top of the VTM which could add some time but it hasn't marred Hall as he goes all-in for the Finish Gate. It's under review and a slight wait there, but no penalties. That second VTM has cost him time and Hall has posted a slightly slower time than we'd expect. Let's see how Sonka answers. Very unfortunate stall there. Fingers crossed for a miracle for Hall!